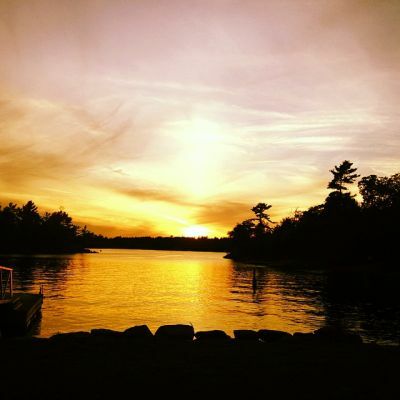 Our beautiful resort is a great option for an exciting Muskoka Georgian Bay getaway! Come experience an authentic Muskoka cottage lifestyle while staying in one of our many available accommodations. We have Rooms, Suites, Cottages, and Family Cottages to suit your needs. The Delawana is located directly on the Muskoka waterfront and has its own private boat docking, 3 individual beach areas, and beautiful views of the lake on all three sides. On-site, we provide various activities for our guests during your stay, such as; mountain bikes, kayaks, canoes, and paddleboats, outdoor pool, multiple playgrounds. We also have fun games such as; horseshoes, jenga, lawn chess, shuffleboard, disc golf, tennis, and basketball court. For local activites, Honey Harbour provides the Day Tripper boat that can take you to visit the beautiful Beausoleil Island for the day in Georgian Bay Islands National Park, where you can hike, bike, swim, and enjoy all they have to offer. There are lots of attractions and activities in some of the surrounding towns and cities such as Midland or Penetanguishene for day trips. Save with weekly stays at the Delawana Resort! You can now check availability or reserve online through our website!